I wasn’t sad to lose Lydia. I knew the day would eventually come when either someone would shoot her out of distaste for her obnoxious vocalizations, or I would take her somewhere else to live. Fortunately, the later occurred first. The thing with driving four hours with a Peahen in the backseat, is that stopping for any length of time really isn’t possible. I knew she was cramped in the pet carrier and didn’t want to stress her anymore than necessary. I did, however, stop at Beckie’s on Highway 62 for an ice cream cone. We arrived in eastern Oregon in the early evening. I followed my GPS instructions to where I was supposed to be… and nothing. 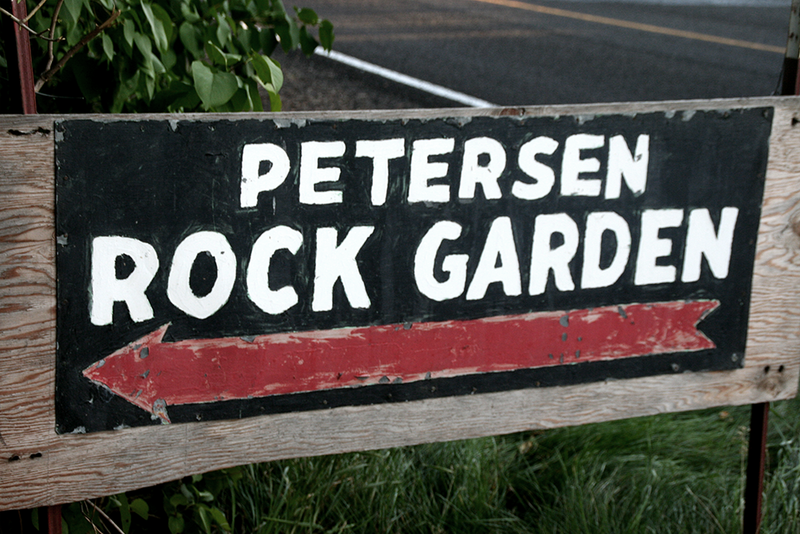 I backtracked a couple of miles, turned off the GPS and paid close attention to signs, finally locating Petersen’s Rock Garden as the sun was dipping behind the hills. I knocked on the door of the house that seemed the most habitable and introduced myself to the woman who answered. She wasn’t all that impressed that I’d brought Lydia, though I’d called her from Grants Pass before I left to let her know I was coming. I hurried to show her that I’d also picked up a big bag of poultry feed to help out with the feeding of the resident Peafowl flock, and to show my appreciation for Lydia’s adoption. It was the only time I saw the woman smile. I then took Lydia’s pet carrier out of the car, carefully put in on the ground and popped the wire door open. I faced the opening toward a large green lawn where a particularly stunning Peacock was strutting around. I waited. Lydia remained in the carrier. I waited some more. I started to talk quietly to her, trying to convince her to come out into her new world. I sat on the grass beside her and waited some more. As I sat, I began to notice the menagerie that is Petersen’s Rock Garden… and the Peafowl started to emerge from the bushes like the Munchkins emerging in the Wizard of Oz to check out Dorothy. Lydia finally conceded and stepped out of the carrier like an emerging princess. She ruffled her feathers and looked around. 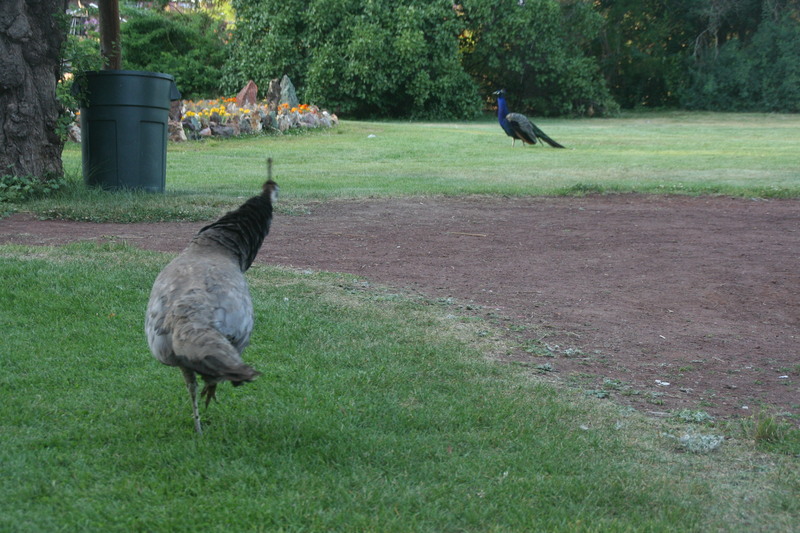 Sure enough, she headed straight for the Peacock…but not too quickly, because, you know, royalty never hurries. I wondered then, what was going through Lydia’s mind. 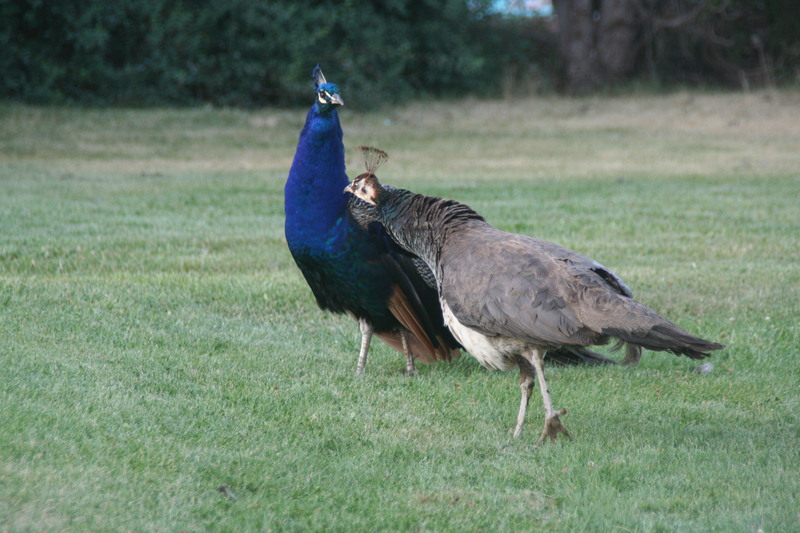 I wondered what Peahens think about. How they think. What they see. What they feel. I wondered this as Lydia made her way toward the glorious bird that was the spitting image of her deceased lover. 1) I would have said “You go ahead and QUIT high school and go out into the world and explore! THEN grab a GED and jump into the university program you want to… WHEREVER you want to… WHEN you want to. Do things YOUR way…. Don’t seek, or wait for ANYONE’S approval… 2) Travel widely… EARLY. Meet new people… learn about new cultures… practice new languages… eat new and strange foods… listen to old and new music… play as many instruments as you can get your hands on… 3) meditate, pray and hang out with monks… often 4) Learn all about water… everywhere… internal and external… swim more… drink more… watch it… touch it… Learn the process/ceremony of “Going to Water”… and do it when you need to; 5) Listen more and talk less… Especially around elders. Yep… I would grab the younger me by the shoulders and plant a big fat kiss on her forehead and tell her how amazing she is, and that Love is the most important thing to learn in this whole lifetime, and that self love is the VERY first lesson in that book. If you’ve never heard the nocturnal cry of a peacock, you might think a woman was being murdered in your backyard. I did. If you’ve never heard the slightly more faint (but not much) call of a peahen, you may think a child is lost and wandering nearby. Either way, the sound annihilates sleep. We moved into our home in Grants Pass, Oregon in early 2000. We “met” the pea couple shortly after that, at about 4 a.m. on a confusing morning, before we even had a chance to put all the towels away. The Pea couple roosted in the giant cedar tree at the edge of the garden. It was clear they had done so for sometime, and our moving in right underneath them wasn’t going to change anything. Eventually, we settled in to our new home, and with the Pea’s comings and goings, but never with their screeching. Within a few months we bought pullets that soon grew into plump Barred Rock laying hens. The Peas started spending more time in the hen house where it was warm, and food was plentiful. 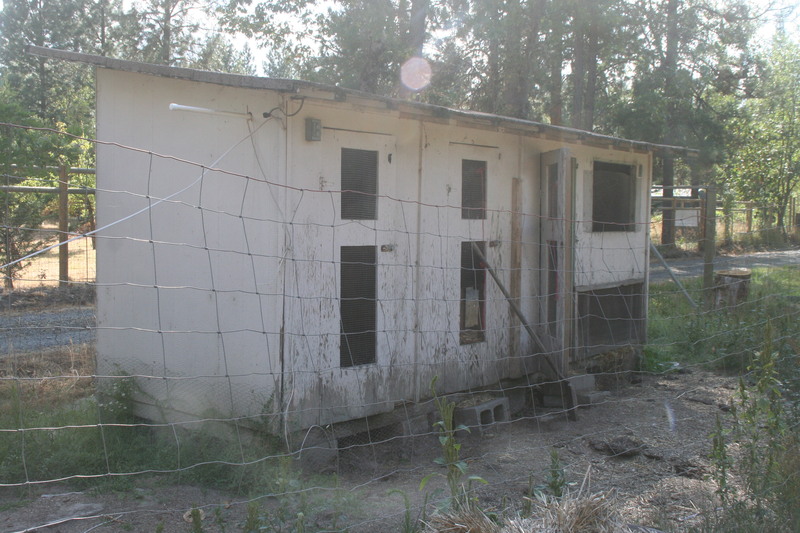 The Pea couple made the hen house their new home. I don’t know when it happened, but I started enjoying having the Peas around. Evidently, my sentiment wasn’t shared by someone in the neighborhood, because one day, the female showed up alone, calling despairingly for her mate. He never returned to her side. It could have been a bullet or a fox. Whatever it was, even the flock of chickens couldn’t soothe the peahen’s desperate wailing. She mourned for weeks. It was spring when I found her clutch of eggs, eight of them hidden under the day lilies. My heart ached for her. Holding up the lily leaves with one hand, I looked up to see her perched on the fence above me, turning her head one way and then the other so she could see what I was going to do with her eggs that were never going to hatch, clacking her beak menacingly. I could tell by the mold growing on the shells, she had been laying them one by one over the months. I suppose I should have left them there, but I buried them. Her cries returned and my husband started grumbling something about getting a gun. That’s when I made a silent pact with her. I promised I would find her a safe place to be. And I gave her a name – Loud Lydia. I started talking to her whenever she was around, and imagined her as a loud (but endearing) bantering old clucky woman. The personification felt like it protected her, even just a little bit, even if just for awhile. It was a game I played with Lydia. I imagined finding a place for her to live where proud peacocks flaunted themselves before her, and I would tell her all about it while I pulled weeds or pruned flowers with her perched nearby. I imagined too, that it would be a place where she could lay fertile eggs and one day strut around around with pea babies clustered and jumbling at her feet. However, after asking around, I realized very few people actually WANT a pea hen IF they had a choice in the matter. 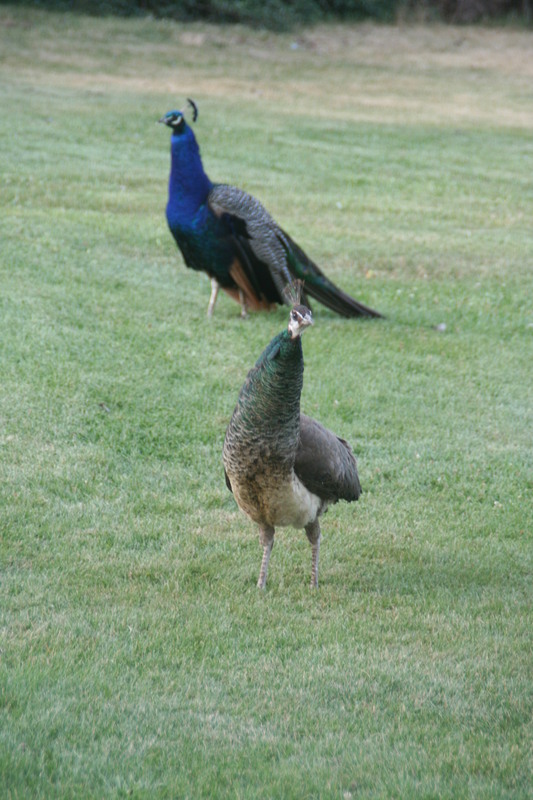 But then a friend told me about a place in eastern Oregon where peafowl abounded – Petersen Rock Garden. (Evidently, once you have one, what difference does 50 make?) I located the place on the internet and immediately knew I needed to take Lydia there. I set to work figuring out how to capture and contain her, and then take her the 231 miles from Grants Pass to Redmond. 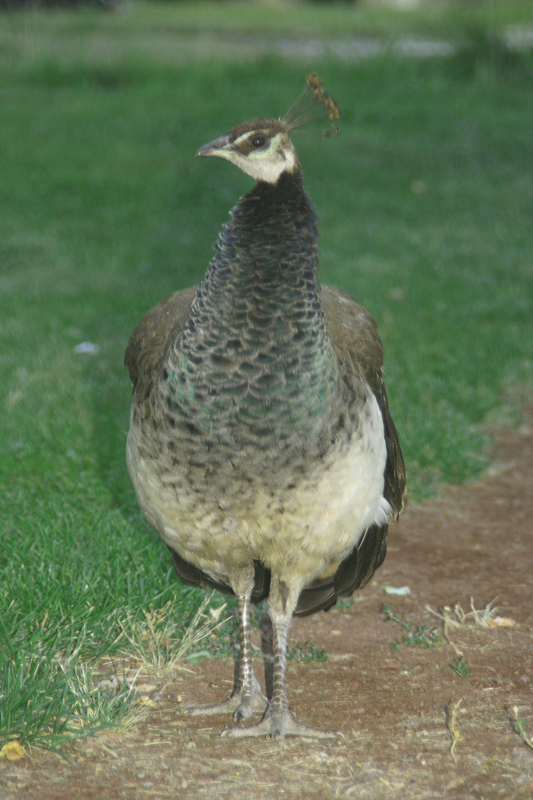 But, a full grown peahen is one fast tough bird. I chased, cornered, fruitlessly netted, clucked, lured, cooed… and consistently failed to capture her. Day after day I watched her sitting on the fence in the sun eyeing the lily bush. 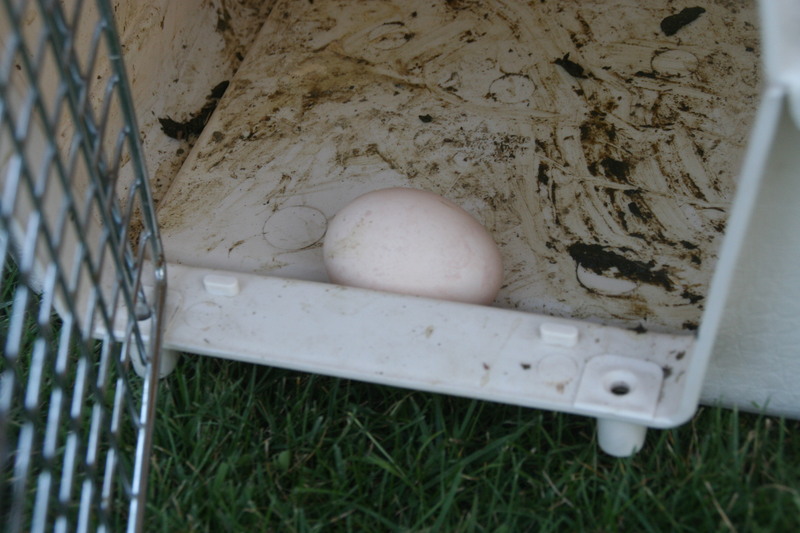 Then it happened… the timing was purely her own… I was standing in the kitchen making bread with the sliding glass door open and heard the clack of Lydia’s beak. I looked down to see her sticking her head in the doorway. I slowly backed out of the kitchen through the back door and came around the corner of the house just in time to see her tail feathers disappear into the house, something she’d never done before. I hurried to the back door and closed it. 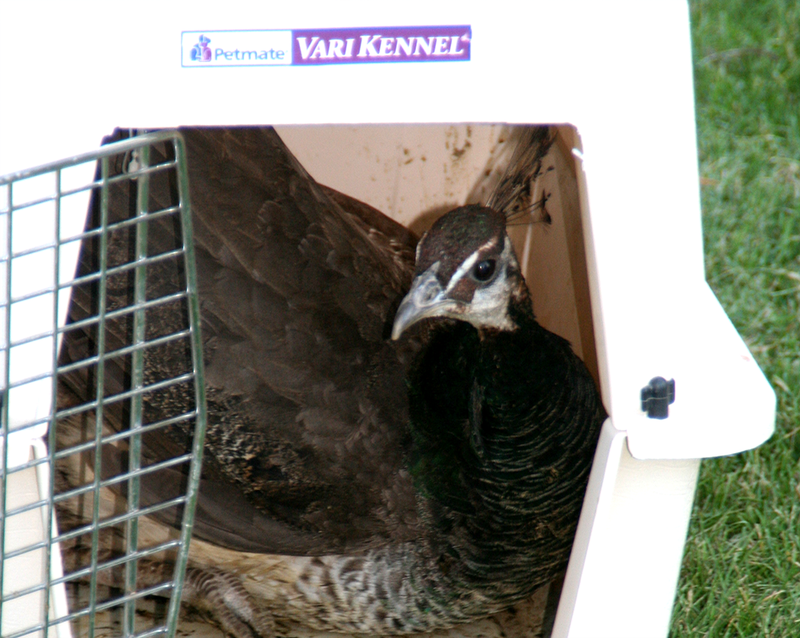 Now, having a freaked out peahen IN the house isn’t all that much better than not being able to catch her outside. My husband would have said it was much worse. Still, I was determined to finish this thing. I grabbed a towel, cornered her in the kitchen and within 5 minutes, I had her safely locked in a large pet carrier.